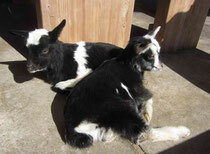 I started researching about the way of getting a goat through the internet and found a goat farm in Okayama. In the middle of January 2011, I called the farm. The owner advised me to find an animal clinic for a goat first. So, I called several clinics, but doctors thought that I was joking or they said just “No!". Finally, I found an animal clinic, so my husband and I took a bullet train to see the baby goats in Okayama. It was the middle of February, 2011. The baby goats were so cute, and we really loved them.